I have been trying to install windows 10 64bit pro N on my UP Core for 2 days now, and i really cant figure out whats wrong. I constantly get WDF_Violation BSOD, with no further error description even after a complet clean installation. After the installer has finished extracting windows, its starts with this BSOD. Even before windows is set up. 1 out of 6 times i can install windows after 3-4 BSOD, but then it just gets worse. I used microsoft MCT to make a UEFI boot usb and i dont think thats the issue. I have done this plenty of times. default/optimized settings. I guess that should be fine? Tried to disable the onboard lan module but it didnt really change any behavior. I have installed my UP Core in the case and with the high speed carrier board and using the original PSU with 5V 4A. The only thing i have connected so far are my USB (testet both with usb 3 and 2 ports) and my keyboard to the high speed carrier board usb port. Once (right now) i managed to get the drivers (from step 1) installed but still BSOD issues. Only difference is that everything is in 4k resolution now. I have noticed that after 4-5 BSOD it sometimes boots normal. Im really stuck with this. I cant believe that the UP Core is the hardest computer to install windows on? I must have missed out on something. I was in the same boat! Let me guess - you were trying to install windows using an ISO you just created in the past few days? If so, it was the new 1803 update from Microsoft. I tried installing this version probably 7 or 8 times when I thought "this worked fine in Linux so it's not a hardware issue". From there I downloaded an "older" version of Windows 10 (1709) and installed it with NO issues! I will try that! If that helps then you are a lifesaver! Its just crazy with the amount of random BSODs i get atm after a fresh win installation! Sorry for late reply. It worked like a charm! It was a bit hard to find the 1709 because it looks like MS has removed the option to download older versions. But it worked 100% with win 10 x64 pro build 1709! Thanks for the tip! Hello guys! I had the same problem here, thank you for the answer! I am now installing an old version of W10. I will then see if the board survives to windows updates. I have almost successfully installed the win 10 x64 pro build 1709, but it has no sound. Then WIndows tried to upgrade to 1803 and the WDF Violation error appeared again. So now I am trying to restore the old version. I hope this compatibility issue will be fixed soon. I have the UP board running perfectly on Windows 10 build 1709. It had no sound just becouse I didn't install all recommended drivers. Now I have all the drivers installed, enjoying the tiny board as a media center. Now, Windows is asking me to reboot the system and to update to 1803. It is quite frustrating me this issue. Im just trying to update my windows atm. I didnt have any sound issues before. I used the driver pack file from this page, under download. After i installed the correct win 1709 and the driveres everything worked as it should. Only problem i have right now is a lousy wifi range. The only way to recover (but needs to be confirmed) is to disable in the driver manager the USB Synopsys driver, that causes the BSOD. This USB Synopsys driver, I do not know what it is used for … this board lacks of documentation, this is a pity. Are you running on 1803 now after disabling this? I tested the audio and i dont have any problems with audio through hdmi. Are you sure the HDMI port you are using are compatible with sound from a pc? I know some ports can make issues. I just have never tried it personally. WDF_VIOLATION ( with WDF remaining for Windows Driver Framework) in Windows 10, for the most part, shows that Windows found a mistake in a system based driver. It's more improbable that this blunder is caused by your equipment. All things considered, the goals of this issue are not that hard to discover. 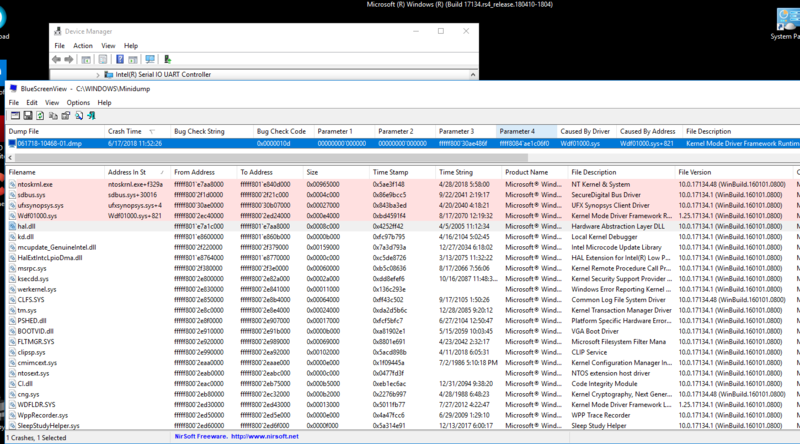 In this post, we will demonstrate to you a portion of the successful strategies to handle the WDF_VIOLATION blue screen of death issue on your Windows 10. You need to fix the issues related to it. Using the below methods. Method 1: Update Device Drivers. Method 2: Use the Driver Verifier. Hello everyone. We seem to have multiple threads discussing the same issue. Since the above link has the proposed fix, and UP had replied to it, I am going to close this thread in favor of sticking to the one thread above. The forums won't let me merge the threads, sorry... Some great info on this thread as well. I even like the title in this one better.